Our Sun, more commonly known as The Sun, to distinguish it from any other suns, is the closest star to Earth, its heat and light providing all the conditions to support life. It is just under 93 million miles from us, which is just over eight light minutes. This means that any electromagnetic radiation emanating from it takes that long to reach us. Its mass accounts for 99.86% of the total mass of the solar system. It's almost perfectly spherical and has a diameter of about 865,000 miles. Its weight has been calculated as being approximately 2,000 million, million, million, million tons. That's a "2", with 27 zeros after it! Our Sun is made up mostly of hydrogen - about three quarters of it. Most of the rest is helium, but there are relatively small amounts of such things as oxygen, carbon, iron and neon. These last ones are "heavier" elements. 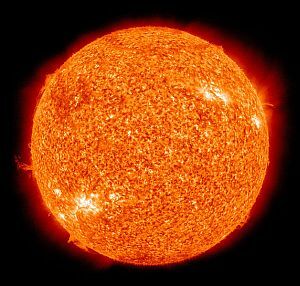 The Sun is busy converting vast quantities of hydrogen into helium every second, by the process of nuclear fusion. This is what creates the heat and light that our planet needs. Fortunately, the supply of hydrogen still available is sufficient to keep the Sun shining for another four to five billion years. Our Sun is situated near the inner rim of the Orion Arm of the Milky Way, about 25,000-28,000 light years from the Galactic Centre. It is travelling around this centre at approximately 486,000 miles per hour. Certain areas of galaxies can be dangerous places, due to large amounts of gamma rays, X rays and cosmic rays. Our Sun's orbit round the Milky Way is quite unique, in that it seems to prevent our solar system from straying into these areas - almost all the time. One dangerous area is the Galactic Centre and the Sun is at just the right distance away to prevent the gravity exerted by the Centre adversely affecting our solar system. This area is awash with the dangerous radiation mentioned above, too. Any exposure to it on Earth would wipe out all life. Other dangerous areas, full of radiation, are the spiral arms. Fortunately, the Sun is positioned inbetween them - and tends to stay there, most of the time. 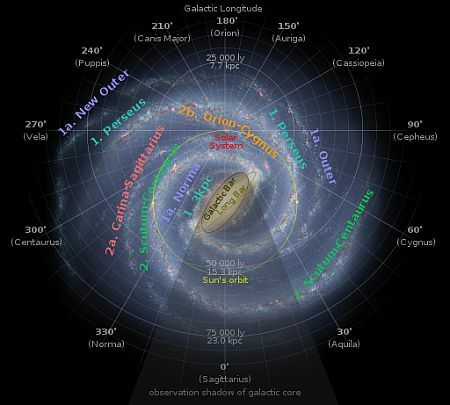 Its orbit round the Milky Way forms an almost perfect circle and its speed pretty much matches that of the spiral arms. As can be seen from the above graphic, the Sun's orbit takes it through a spiral arm twice in one revolution. It makes a complete orbit of the galaxy in around 250 million years, so, every 125 million years, the solar system passes through this area of dangerous radiation. This adversely affects the planet Earth, the time scales appearing to match up with the various ice ages from the planet's past. It has also been suggested that these spiral arm transitions could also be connected with certain mass extinctions Earth has experienced. Our Sun is classed as a G2V star. The "G" identifies its spectral type (yellow-white), the "2" subdivides that into stars with surface temperature of around 5,700 degrees and the "V" is its luminosity, identifying it as a main sequence star, producing its heat and light through nuclear fusion. More informally, it is classed as a yellow dwarf or G dwarf star. Obviously, astronomers can't see inside the Sun, so, to find out more about its interior, a science known as "helioseismology" is used, where pressure waves deep inside it can be tracked and monitored. The core of our Sun is where all the action takes place. Its size is one quarter of the Sun's radius and here, because all the nuclear fusion is going on, the temperature is a whopping 14.5 million degrees Kelvin. 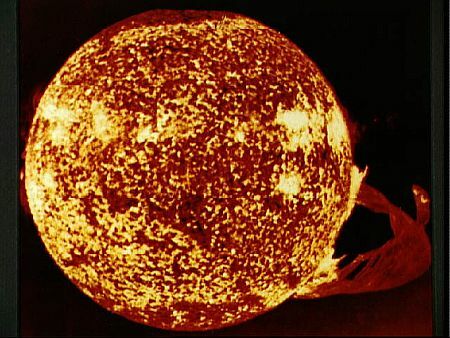 99% of our Sun's total power output is generated within the core and, from there, it then has to fight its way to the surface, to be radiated into space. The time it takes photons of energy to travel from their source in the core up to the surface of the Sun may surprise you. Due to their constant, random changing of direction and repeated absorption and re-emission during their journey through the various interior layers, it has been estimated to be anything from 17,000 to as much as 50 million years! On the other hand, other things produced in the nuclear fusion at the core, neutrinos, take just over two seconds to reach the surface. These various "zones" are named after the methods used by the photons of heat and light produced in the core to reach the surface. This zone extends from the edge of the core to three quarters of the Sun's radius. Because of the fact that, in this area, the matter is still so dense, only the process of radiation is possible to transfer the heat. At the inner boundary of this zone, the temperature has already dropped to 7 million degrees and will cool further as the outer edge is approached, to 2 million degrees. Between the Radiative Zone and the next major zone is this relatively thin layer. It is caused by the fact that the material in the Radiative Zone moves round the centre of the Sun as a solid block, whereas the next zone, being less dense, displays properties more like a gas and moves round the centre at varying speeds. Thus there is a small area where these two different zones effectively scrape against each other and this is termed the Tachocline. The friction involved acts as a sort of magnetic dynamo and plays a part in the creation of our Sun's magnetic field. 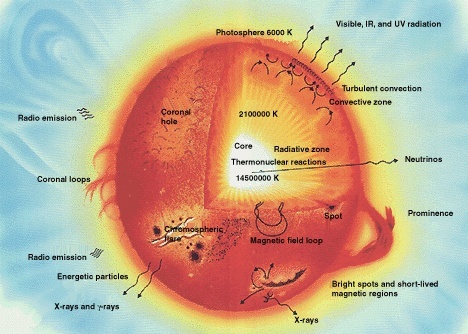 This area extends to the Sun's surface and in it, the solar material is not dense enough to support radiation. So, thermal convection takes over. This involves a continuous cycle of hot material rising to the surface in a huge column, dissipating its heat and light at the surface, then diving back down to the inner edge of the zone, to heat up again. This action also produces a magnetic dynamo effect, playing a part in the Sun's magnetic field. This is simply the surface of our Sun, the bit we can see. Here, the photons of heat and light have finally reached the end of their journey, to fly off into space. At this distance from the centre, the temperature has dropped to 5,700-6,000 degrees. It doesn't end there! The area outwards from the surface of the Sun - its atmosphere - consists of several key layers, one extending beyond the outer edge of the solar system itself. Various aspects of these atmospheric layers affect the Earth in different ways. This is a layer beginning at the edge of the photosphere and extends around 1245 miles into space. It is not very dense at all, but displays a strange characteristic of becoming hotter the further out from the Sun it gets. 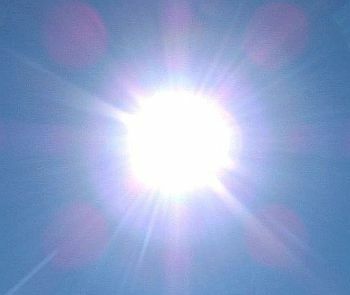 The area nearer the surface of the Sun is about 4,500 degrees, but, by the time its outer boundary is reached, the temperature has increased to 10,000 degrees. The chromosphere is usually invisible and can only be witnessed as a reddish flash at the beginning and end of a solar eclipse. This feature of our Sun can be considered an atmosphere of sorts, consisting of plasma and extending many miles into space. 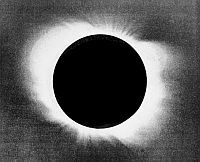 As can be seen in this picture, it is easily observed during a solar eclipse. It has an extremely high temperature, at around a million degrees. The reason for this has puzzled scientists and there are a few theories around to account for it. One attributes it partially to the Sun's magnetic field, which is very active within it. The high temperature makes for several distinct features within the corona, which, in turn, help to create the various familiar solar phenomena discussed below. The corona is not uniform all over the Sun. There are so-called "active regions", usually caused by energetic magnetic flux. 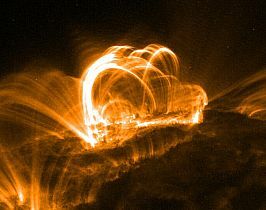 Things called "coronal loops" can rise up from the corona and, due to heightened magnetic activity within them, can eventually result in solar flares, sunspots and prominances. Conversely, there are "coronal holes", quieter areas around the north and south poles. They provide a gateway for the magnetic field to escape the surface into space and this is manifested as the "solar wind". This is an area created by the solar wind and extends out from the Sun, beyond the orbits of the planets. It only ends when it collides with the interstellar wind and the two effectively cancel each other out. 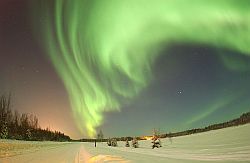 The solar wind is a stream of charged particles, travelling at great speed. It attains this speed from the extremely high temperature of the corona, aided by the magnetic field streaming out of the coronal holes. This solar wind, in turn, creates the heliosphere. At first, the wind travels at around 620,000 miles per hour and keeps this up all the way past the orbits of the planets. Eventually, it begins to react with the interstellar medium, which slows it down. As it passes from supersonic to subsonic speeds, something akin to a sonic boom takes place and this is called the "termination shock". 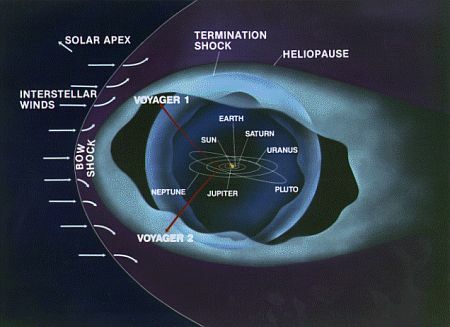 Soon after this, the continuing deceleration culminates in the solar wind stopping altogether and this point is termed the "heliopause". 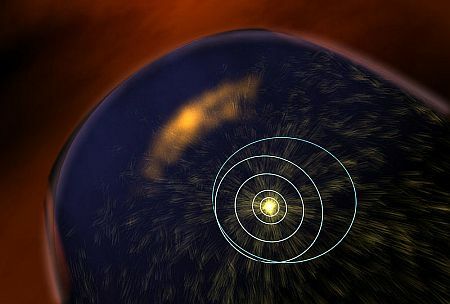 On Earth, the solar wind is largely deflected by our planet's magnetic field. Occasionally, however, some of the charged particles can break through it and manifest themselves as the auroras, borealis and australis. Our Sun displays a few distinct features, which are quite well known. The activity of some of them can seriously affect life on Earth. Probably the most famous feature of our Sun, these dark spots on the surface are caused by instances of intense magnetic activity. As mentioned above, heat is transmitted through the convective zone as great columns of plasma. This increased magnetic flux has the effect of stopping the column from reaching the surface, resulting in the dark, cooler patch - the sunspot. They usually occur in pairs, each with an opposing magnetic polarity. They can last for just a few hours or stay in place for several months. Our Sun passes through an approximately 11 year sunspot cycle, ranging from hardly any sunspots to loads of them. When there is no sunspot activity, this appears to adversely affect the weather on Earth. There was a famous period in the 17th century when the Sun was almost sunspot-free for several decades. As a result, parts of Earth, including Europe, suffered exceptionally cold temperatures, so much so, it was dubbed the "Little Ice Age". The Thames river, in London, froze over at this time. Sunspots play a part in the creation of the next two phenomena. The main difference between a solar flare and the phenomenon mentioned next is that the flares are open. They may fall back to the Sun's surface, but they are only connected to the star at their place of origin. 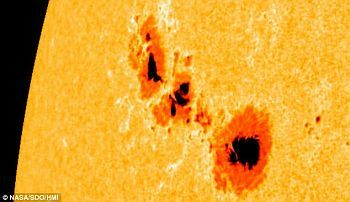 As stated in the section above, these flares are one of the results of the enhanced magnetic activity surrounding sunspots. They are created when accelerated charged particles interact with the Sun's plasma. The acceleration is due to what is termed "magnetic reconnection". This process produces vast amounts of energy and accelerates the particles. These phenomena are closed loops, tethered to the Sun's surface at either end. Connected to the photosphere, they are a lot cooler, thus appearing, by comparison, quite dark. They can appear within a day and may stay in place for several months. Sometimes, large prominences with sufficient energy detach themselves from the Sun and shoot off into space. Termed "coronal mass ejections", or "CMEs", they travel through the orbits of the planets, eventually reaching the heliopause. CMEs passing through the Earth can cause problems with satellites and other electrical systems. Large portions of the habitable areas of the planet have had power outages of several hours as a result of one of these. I bet you didn't think there was that much to our Sun, did you?